Iranian Foreign Minister Mohammad Javad Zarif Sunday appeared to rule out any new extension to tough negotiations with world powers over his country's suspect nuclear program, as he met top US diplomat John Kerry for new talks, AFP reports. "I do not think another extension is in the interest of anyone, as I do not believe this extension was either necessary or useful," Zarif told a global security conference, meeting in the southern German city of Munich. "In my view extension is not useful, not conducive to an agreement, and all my energy and focus and that of my colleagues and I'm sure my negotiating partners .... are all focused on reaching an agreement as early as possible." Kerry and Zarif held a second round of talks here Sunday, meeting for about 90 minutes as they try to hammer out a political accord to rein in Iran's atomic ambitions ahead of a March 31 deadline. Kerry was due to fly back to Washington later in the day. Few details of the tough negotiations have leaked, but world powers are trying to ensure that Iran's pathways to developing a nuclear weapon are cut, in return for a gradual easing of international sanctions which have crippled Iran's economy. Zarif refused to publicly discuss the details of the negotiations for an accord, but said "we are engaged in a very serious discussion." "We believe it is in our interest to show the world that our program is exclusively peaceful." But he also said: "I don't think if we don't have an agreement it will be the end of the world. We try, we fail." He took issue with the idea of a gradual phasing out of the sanctions, saying there was nothing in the November 2013 interim accord saying that the punishing measures would be removed in a step-by-step process. The Islamic Republic has long denied accusations that it is seeking to develop an atomic bomb, arguing that its nuclear program is solely for its civilian energy needs. But skepticism is mounting about whether a deal is possible, after two deadlines for a comprehensive agreement were missed. Iran and the group known as the P5+1 - Britain, China, France, Germany, Russia and the United States - now want to conclude a political agreement by late March, with a final deadline pinning down the technical details by the end of June. 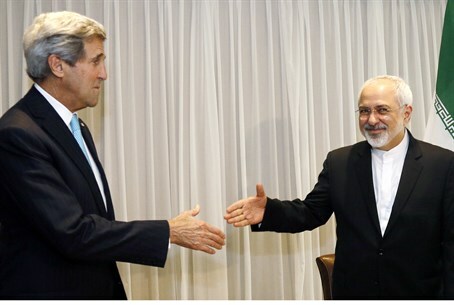 Kerry and Zarif have met many times, mostly in European cities, as they seek to thrash out the complex deal. But both men are under pressure from hardliners back home, with US lawmakers threatening to try to unleash a new wave of sanctions on Iran after March. Israeli Prime Minister Binyamin Netanyahu also heaped on the pressure, telling his cabinet Sunday that "world powers and Iran are galloping towards an agreement which will allow Iran to arm itself with nuclear weapons, something which will endanger the existence of Israel." "We will continue to act and lead international efforts against Iran arming itself with nuclear weapons, we will do everything and we will act however possible to foil this bad and dangerous agreement which will put a black cloud over the future and the security of Israel." Meanwhile, Zarif agreed there was a "huge deal of mistrust in Iran vis-a-vis the West and the United States in particular", arguing that Iranians were "right" to be skeptical about American intentions given the three-decades freeze in diplomatic ties.